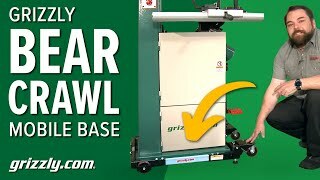 We took years of input and months of testing and design to come out with the Grizzly "Bear Crawl" Mobile Base. Its 1200 lb. 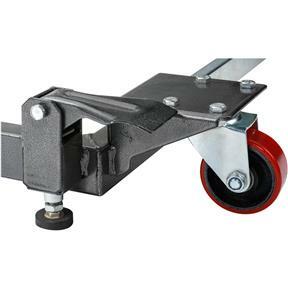 capacity, steel and polyurethane heavy-duty ball bearing wheels, and toe flip-stops are only a few of the features that will make this mobile base a staple under your machines for years to come. Adjusts from 19" x 21" to 29-1/2" x 29-1/2"! My G1023RLW table saw rolls as it should almost effortlessly. Very well made for any heavy equipment that you need to move around from time to time. I am glad I purchased and would again if need be for other equipment. Really a nice little mobile stand but too bad Grizzly doesn't offer it in a version with 4 casters rather than just the 2. 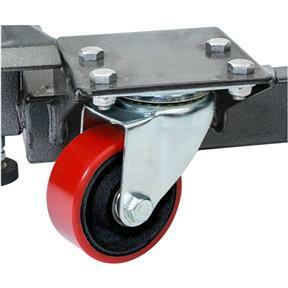 Mobility can be quite limited but it seems to maneuver best if you install with the casters along the narrow side of your machine. This is a heavy duty Crawl and fit to my table saw with no problems. This is a great design, easy to assemble and works great. My only concern is that its not all that simple to get a heavy piece of machinery like bandsaw or table saw in place onto the mobile base! I have a number of the Bear Crawl mobile bases and like this design better than those from other companies. The base is easy to assemble. It is low to the ground and very stable. The "lift feet" or immobilizers are the best out there. All it takes is two easy pushes with your toe and the base is set. Other designs require one to kneel down and turn screws or bend an uncomfortable lever. i am using the bear crawl on my router table - works extremely well - very easy to move my router around the shop - much better than the shop fox bases that i have - would highly recommend this base to anyone looking for a base to move heavy shop machines around their shop!!! Works great with my G0771Z table saw. Sturdy and movable. Very nice base, goes together easily, very sturdy and holds equipment securely. I now have three of these because of my small work space everything must be mobile, and these work great to accomplish that. You can buy with confidence on these bases. Go Make Something! Exactly what I expected. Works great. Only downside, no instructions. Had to use the picture on the box to put together. The Bear Claw is just the thing for my small shop. I put my bandsaw on it and move where ever I need it. It does the job and was easy to put together. Makes it easy to clean up the saw dust that falls through the bottom of the saw. Good solid mobile base. I like the mechanism better than others I have used. I bought this for a new G0513X2BF bandsaw. Moving the bandsaw is effortless. This product is vastly superior to the Shop Fox mobile base. In time I will replace my Shop Fox mobile bases with the Bear Crawl. The only negative is the fabrication is a lower quality than you normally expect Grizzly machines. The factory needs improve their QA. I purchased this for a 14" G0555LX Bandsaw. Heavy duty product that was very easy to assemble. It was a little large for the base of the saw. I cut off 2 inches on one side for a snugger fit, and drilled holes to bolt the saw base in. Now has a great fit. Rolls very easy on concrete shop floor. Another good product from Grizzly. Much better than the shop fox base! Using with the 1023rl. I had originally purchased the Shop Fox base with my bandsaw. I did not like that I had to get down on the ground to lock down the feet when I moved the saw into position. The foot locks on these are much more functional. Better wheels and wider rear stance for the saw on the Bear Claw makes it more stable. I replaced some of the Rail Bolts that came with the Bear Crawl with Set Screws so the bottom storage door of my saw would not hit the head of the rail bolts when attempting to open the door, maybe a future enhancement from Grizzly. Purchased 2 originally and they worked great. A small modification for a smaller base required only shortening the base extensions. They worked so well I purchased two more. Solved small work shop tool relocation issues. Great product Purchased another one after the first 3. best way to store and move around equipment in a limited work space. Very stable platform when locked down. The thing is awesome ! My 500 lb. 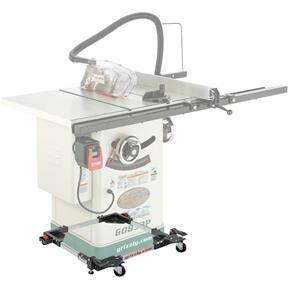 GS10L table saw moves around like butter on a skillet. I should have purchased one like this for my band saw . The foot levers to lock and unlock are easy to use and arent big and clunky either. 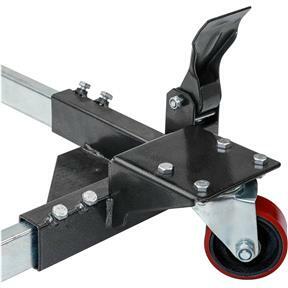 The lifting mechanism is close to the ground so the foot pads can get hung up and drag when rolling across uneven surfaces like you might encounter at an opening to a garage where the driveway is a bit lower than the garage slab. The assembly was strait forward and simple and the product met all of my expectations which seems to be rare these days. It actually does what it is supposed to do without modification ! 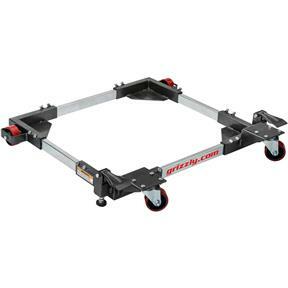 I have no problem recommending the Bear Crawl Mobil base and will purchase another one for other machines when in need. This was everything I expected it to be and works well with the mobile base I purchase for it! I bought two mobil bases at the same time, a Shop Fox and the Grizzly T28000. The Shop Fox worked great, but one of the wheel locks broke right away on the T28000. It ca be welded but who wants the hassle. 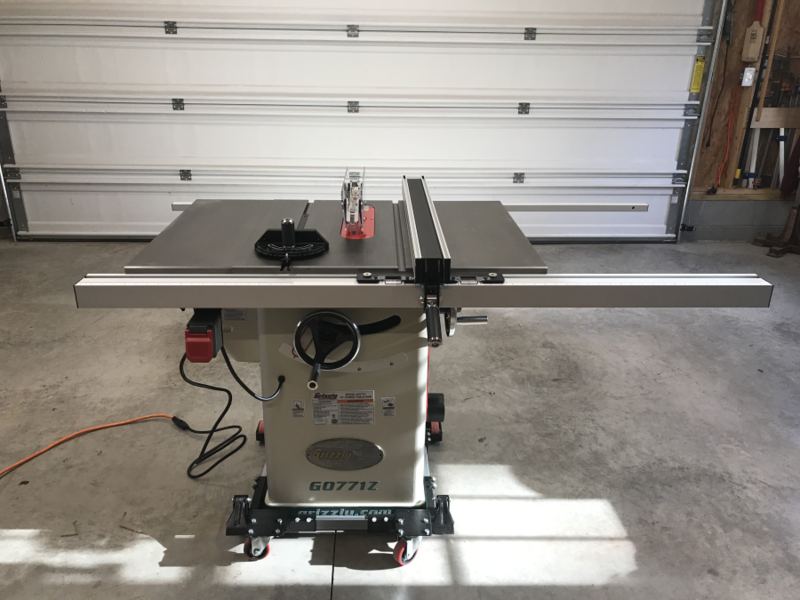 Purchased this base to go with my new G1023RL tablesaw works perfect. Easy to assemble. I will purchase again in future for other tools . Priced right for great quality base. Great base, easy to assemble and makes my small shop usable with all of my equipment mobile. I bought this product about a two months ago. This is made of all steel and very doable and easy to assemble. I would definitely buy another one for other equipment. I use them on my various woodworking machines to clean under and to move them to make maximum space. Easy to move. Works great for my G1026 Shaper to move it out from the wall for use. Foot levers are easy to operate and the machine is very steady when the levers are down. Good value. Extremely heavy duty, much better than I expected for the price. This mobile base was recommended by someone on a WW forum and I decided to give it a try. Excellent product, easy to assemble and very sturdy - highly recommend! My current experience with mobile bases has primarily only been with the standard Shop Fox that I bought with my tablesaw 7-8 years ago. The Shop Fox works as advertised however the quality and engineering were lacking. With this new *Bear Crawl* it's a world of difference!!! The thought that went into this product is unheard of at this price point. 1. I managed to strip one caster mounting bolt... by hand. So keep in mind these bolts aren't the highest strength. 2. The adjustable feet are adjusted all the way up and are just barely above the floor surface. I own a few mobile bases and this one is by far the best one. Its super heavy duty and rolls perfectly. Same price as the crappy ones but way better quality. Highly impressed. Appears to be heavy duty. It was easy to assemble and put under my table saw. While I didnt need it, I like the fact you can assemble it around the base of a large tool and dont have to lift the tool in the base. Excellent heavy duty base. Using with the G1023RLW. Works very well.